It is estimated that one in three smartphones shipped in 2018 will be a phablet, which is more than double their projected share for 2014. For Google -- with Android still likely to run on the majority of phablets -- helping developers to properly optimize their apps for larger screens has become a top priority. Ensuring that Android phablets provide a great user experience is paramount; otherwise, users may jump ship to Apple's iPhones or Microsoft's Windows Phones. 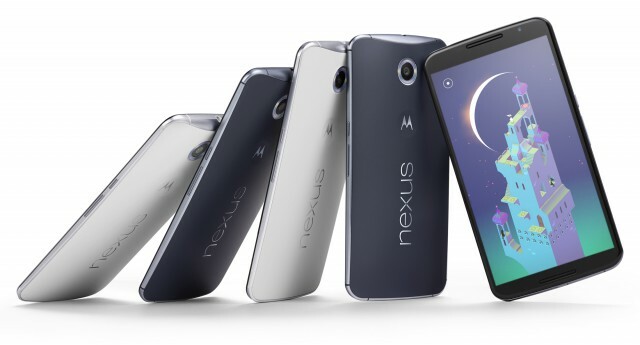 So, today, Google takes the wraps off its first phablet, Nexus 6. It is the embodiment of all the great features we have come to expect out of a phablet from late-2014: super high-resolution screen, super fast processor, solid cameras, very thin bezels and a huge battery. As expected, Google also announced a new tablet, the first one to come since July 2013, called Nexus 9. It does not disappoint either. Of course, both run the new Android 5.0 Lollipop, which is shipping in the next few weeks. But, first off, let's talk about Nexus 6. The Motorola-made handset packs a whopping 5.96-inch screen with a resolution of 1,440 by 2,560; that equates to a pixel density of 493. The resolution has become standard for flagship smartphones launched in the second half of 2014, so it is only natural that Google would want to use it in a phablet which will most likely be its only one for a year. It is also a resolution for which few titles are optimized, which makes that much more relevant. Power comes from a 2.7 GHz quad-core Qualcomm Snapdragon 805 processor, coupled with 3 GB of RAM, and a 3,220 mAh battery. By the looks of it, battery life will be better than with past Nexus smartphones. Turbo Charge will ensure that, after just 15 minutes of charging, it will add around six hours of battery life, which is nice. On the back, there is a 13 MP camera, which features optical image stabilization (OIS). It has a large f/2.0 aperture, which should mean great image and video quality in low light. It is a welcome upgrade coming from Nexus 5, which camera boasts a smaller f/2.4 aperture, but still offers OIS. On the front, there is a 2 MP shooter, which should be good for selfies and video chats. Nexus 6 is offered in two storage options: 32 GB and 64 GB. Naturally, there is 4G LTE connectivity on board, as well as other typical features like NFC and Bluetooth 4.0 LE. It also packs stereo front-facing speakers, like HTC One (M8). Available color options are Cloud White and Midnight Blue. It will cost $649 off-contract, according to Motorola, and Google says it will go up for pre-order later this month. Nexus 6 will be offered at AT&T, Sprint, T-Mobile, Verizon, US Cellular (on-contract) as well as Best Buy (on-contract as well, probably), Motorola's online store and Google Play (unlocked). Nexus 6 will go on sale in 28 countries in North America, Europe and Asia-Pacific later this year and "into Q1" 2015, says Motorola. T-Mobile has already announced that Nexus 6 will be through its online and brick and mortar stores starting November 12, for $0 down coupled with $27.08 monthly payments for two years, on its Equipment Installment Plan. It is worth noting that Google will keep selling Nexus 5 alongside it, probably because lots of people have asked it to, in the same trims as before: black or white, with 16 GB or 32 GB of internal storage. Nexus 5 is currently listed from $349 on Google Play. 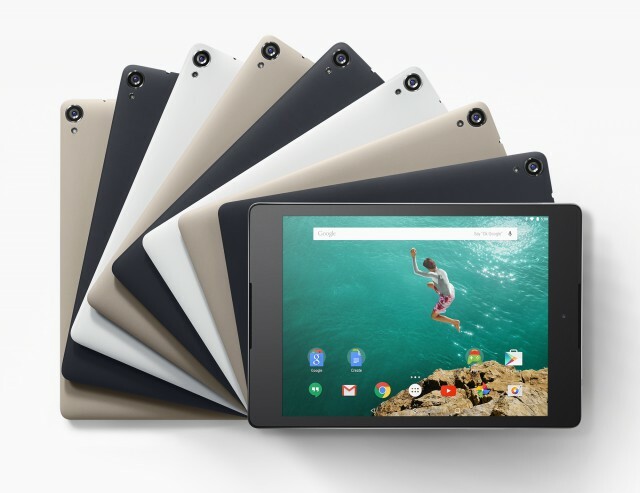 As far as Nexus 9 is concerned, Google's new tablet -- which is made by HTC -- packs an 8.9-inch display with a resolution of 1,536 x 2,048. That resolution is what Apple uses in its Retina iPads; it is also the first important Android tablet with a 4:3 aspect ratio. Power comes from a 64-bit 2.3 GHz dual-core Nvidia Tegra K1 processor, with 2 GB of RAM, and a 6,700 mAh battery. It ships with 16 GB or 32 GB of storage, depending on which version you get. There is also a 4G LTE version with 32 GB of internal storage offered. For those who like to take photos with their large tablets, Google has opted for an 8 MP camera on the back and a 1.6 MP shooter on the front. Since the latter will probably get the most use, the relatively low megapixel count (compared to other Nexus devices) is likely to disappoint, at least when it comes to selfies and video chats (1080p is out of the question). Other noteworthy specs include NFC and Bluetooth 4.0 LE as well as BoomSound stereo, front-facing speakers. Nexus 9 comes in at 8.9 x 6.05 x 0.31 inches. It weighs 425 grams for the Wi-Fi models, and 436 grams for the cellular version. Nexus 9 will be available starting November 3, with pre-orders kicking off on October 17. According to The Verge, it costs $399 for the 16 GB model, $479 for the 32 GB version and $599 in the 4G LTE trim. Update: This story has been updated with additional information regarding Nexus 6 colors, price and availability, and Nexus 9 hardware specifications and price.